Faiths Forum for London “empowers religious communities to work together for a better London”. At least that’s what their website says. And they seem to do an awful lot of good works out of pure and honourable motives: providing channels of communication between faith communities; promoting inter-faith engagement; sharing best practice on issues of common concern; and highlighting the positive contribution made to society of all religious groups in London. They have lots of distinguished and venerable Council members and lots of impressive patrons with knighthoods, OBEs and stuff. Europe has had a hard time recently, in-particular the Eurozone crisis has brought many challenges; the austerity policies to combat the crisis have dominated both European and national elections. The cuts in public spending in Eurozone member states have largely been imposed by the EU. The 2014 Election will also be the first time that European citizens will be able to choose who will hold the most powerful executive position in the EU. The two main European political parties, one of which will most likely to go on and appoint the European Commission President, are Europe’s centre-right and centre-left parties, each having vastly different positions on policies to tackle the Eurozone crisis. Across the UK, there is an increase in apathy and mistrust of the political establishment and political parties. According to Eurobarometer, a public opinion service of the European Commission, 60% of Europeans “tended not to trust the EU”, compared to the 32% distrust level reported in early 2007 before the onset of the 2008/2009 global financial crisis and the ensuing euro zone debt crisis. In Britain there is evidence of steadily growing disillusionment with 68% of citizens saying they had little confidence in the European Union. All this is reflected in the growth of specifically anti EU and Eurosceptic parties who will seek to gain seats in the May 2014 elections. It’s all nice and equitable: centre-right and centre-left; Euro-realist and Euro-apocalypse. 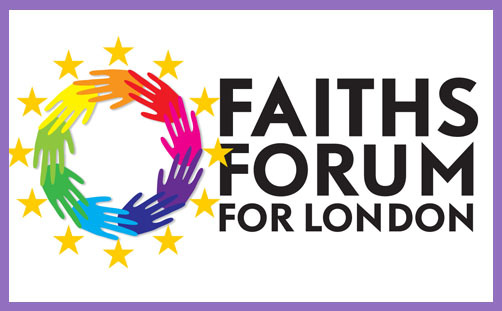 So you’d think, out of political neutrality and effective networking cumulation, that Faiths Forum for London wouldn’t take a partisan stance on the EU Referendum, but rather foster relations with both Leave and Remain faith leaders, not least because (according to current polls) either outcome is a distinct possibility. But no, Faiths Forum for London are firmly in the Remain camp, which is fine, for many honourable Christians are (and the foot-stamping elders and ministers on the Mound certainly are). But what isn’t so fine is engaging in collusion and data manipulation in order to present London’s faith leaders as being pro-Remain, when some (or even many) might not be. Consider this letter which they sent to their registered faith leaders (and presumably to their Council members and impressive patrons with their knighthoods and OBEs and stuff), which was accompanied by a request for them to append their names. Faith is about integration and building bridges, not about isolation and erecting barriers. As leaders and senior figures of faith communities, we urge our co-religionists and others to think about the implications of a leave vote for the things about which we are most passionate. The past seventy years have been the longest period of peace in Europe’s history. Institutions that enable us to work together and understand both our differences and what we share in common contribute to our increased security and sense of collective endeavour. What’s more, so many of the challenges we face today can only be addressed in a European, and indeed a global, context: combatting poverty in the developing world, confronting climate change and providing the stability that is essential to tackling the current migration crisis. We hope that when voting on June 23, people will reflect on whether undermining the international institutions charged with delivering these goals could conceivably contribute to a fairer, cleaner and safer world. I received this email yesterday, and have been requested to circulate to faith leaders. They are coordinating a letter from religious and belief leaders pressing people to think very carefully before voting to leave the European Union. It reiterates the point so eloquently made in a different context by Pope Francis that faith should be about building bridges not erecting barriers. It says that so many of the issues about which people of faith care so passionately – from alleviating poverty to tackling climate change – depend on strong international institutions. It stops short of formally endorsing the remain campaign so as to avoid being overtly political. However, it would be seen as support from the signatories for Britain to remain in the EU, which is how we would present it. I do not know what your personal views are on the referendum, but if you think you might be willing to put your name to such a letter in a personal capacity, then please let me know and we will add your name to the letter. I need to send names across later this afternoon so appreicate (sic) a prompt response. One expects honesty, integrity and transparency from the Faiths Forum for London. London’s faith leaders would certainly expect it from the organisation which purports to represent them to London’s public authorities, NGOs and the media. This collusion and covert manipulation falls short on all counts. How can we now know whether any press releases issued by Faiths Forum for London on any important matters of public policy – equality, diversity, policing, education, social care – are not similarly a product of collusion and political manipulation?